Baker Ross is a site that is fairly new to me but it's fair to say it's now one of my favourites. Why? They sell some really cool bits and pieces that are ideal for rainy day activities. There Halloween Sale is pretty good and there are 28 spooky arts and craft items reduced in it. You can have fun and save yourself £££'s whilst your at it. Seriously, have a look. You will soon be shunning pricey Hobbycraft for those make and do things for the kids. Halloween is a time when most of us parents get creative in one way or another. It may be that you make your decorations, paint your child's face or bake some trick or treat goodies. The Baker Ross Halloween Sale is handy for a helping hand in creating some spooky delights. 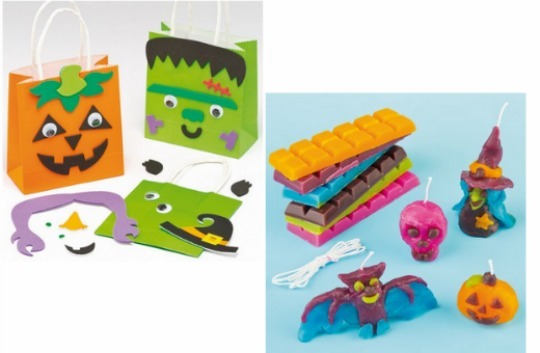 Check out these bargains: Halloween Treat Gift Bag Kits (Pack of Four)*was £3.96 now £3.60, Ceramic Pumpkin Tealight Holders* was £4.48 now £3.96, Dangling Spider Pom Pom Kits* was £3.49 now £2.99 and Halloween Candle Making Kit* was £8.99 now £7.99. You can have your Halloween items delivered to your home FREE if you spend £50+ or £2.99 when spending less than that.